La La Land is a magical movie about love and dreams. It’s simultaneously a throwback to classic musicals, a modern romance, and a timeless riff on chasing your artistic passions. The enthusiasm with which writer/director Damien Chazelle shows and tells the story is infectious; the musical numbers elate and the emotion exhilarates. And, occasionally, devastates but La La Land is never without a pep in its step or hope in its heart. The grounded fantasy begins in snarled Los Angeles traffic. Drivers – probably on their way to an audition or a service industry job that pays (some of) the bills – burst from their cars and break into song and dance. It’s a cathartic, and hugely entertaining, respite before they settle back into gridlock. 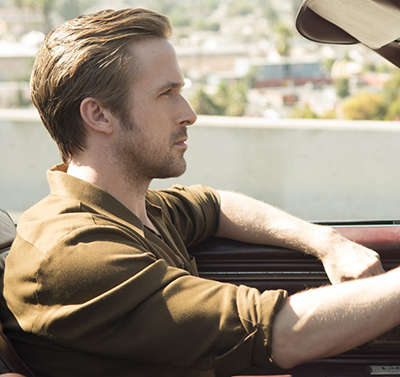 Two of the commuters are Sebastian (Ryan Gosling) and Mia (Emma Stone). He’s a jazz pianist who hopes to own his own club that honors the traditions of the music. She’s an aspiring actress who works at the coffee shop on the studio lot. After a series of meet cutes Sebastian and Mia fall in love, their romance trajectory marked by titles of the changing seasons. Her needling him at a party as he plays in an ’80s synth cover band is a highlight of the courtship, but things really start to click during a delightful song and dance. At twilight, the couple looks out over the valley from a conveniently placed park bench flanked by a glowing streetlight. They lament the fact that they can’t spend the beautiful evening with someone they love, and soon they’re dancing and singing about the regret. Their magnetism is undeniable and we watch them fall for each other through their performance. Though Gosling and Stone aren’t naturals like Fred and Ginger, their commitment to selling the sentiment works wonderfully. Every melodic interlude is used to invigorate as well as communicate the story and its themes. Mia’s slow-motion walk through a frozen throng of revelers at a Hollywood party conveys her fears. She and Sebastian literally float on air during a date. As Sebastian’s career veers towards success that’s not artistically fulfilling, his substantial talents are still used for a contemporary track that’s appealing to us if not him. Through it all, Chazelle, cinematographer Linus Sandgren, and composer Justin Hurwitz set the mood with the perfect marriage of sights and sounds. Chazelle uses long takes for the musical numbers, which showcase the choreography and allows us to get wrapped up in feelings rather than frenzy. The moments between the music are far from lulls. Stone and Gosling are fantastic actors and the chemistry they flashed in Crazy, Stupid, Love. is more intense here. 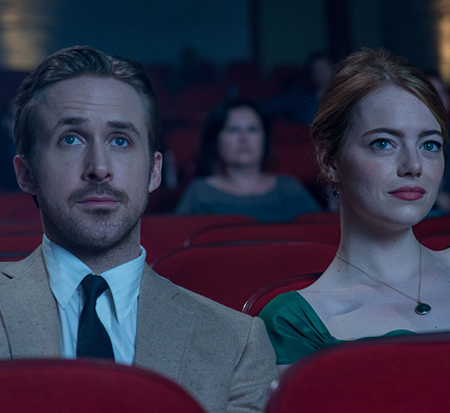 They’re also great individually; Stone’s auditions to disinterested casting directors are both amusing and anguished, Gosling’s daydreaming is irresistible both as fantasy and eventually achievable goal. 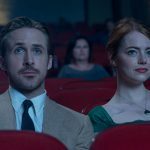 With fantasizing characters that are fanatic about classic craft, whether it be old Hollywood movies or traditional jazz music, La La Land may have its head in the clouds but its feet are always firmly planted on the ground. It gives us real people and palpable convictions to root for – and we do, jubilantly. It all culminates in a rollicking final act routine that mines the devices of the musical’s golden age while also beautifully summarizing the emotional journey of Mia and Sebastian. The tuneful, and soulful, performance of their relationship may not totally match reality, but like good jazz its more about the sensations it stirs. However it turns out for the couple personally and professionally, they’ll always have the enchanted times spent supporting each other’s dreams. And we’ll always have La La Land to enchant us.